"Should you do not agree to the proposals, it may be necessary to dismiss you with notice and offer re-engagement on the revised terms"
The refusal to sign is understandable, given that the new contracts will mean a loss of around a third of the pay of some staff. 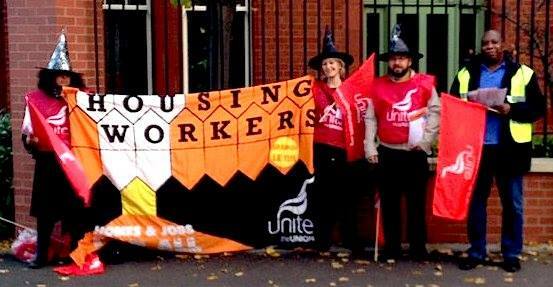 The new threat has led the Unite Housing Workers branch to bring forward a national meeting of reps and key activists from across the country originally scheduled for the end of the month, but which will now take place on the evening of Tuesday 22nd November. The meeting will plan the next phase of the campaign. Any Sanctuary member interested in attending, or non-members who are interested in joining, should contact the Unite branch here. Unite has been campaigning against the cuts, most recently through a day of action in Worcester. Union activists engaged in mass leafletting around Sanctuary's student accommodation, in the town centre, and across local estates. Many local residents expressed anger at the unjust treatment of Sanctuary workers. Activists also made representations to the Mayor and other councillors. Sanctuary has its headquarters in Worcester and is where its chief executive David Bennett is based. Unlike the frontline workers, his salary tops a whopping £320,000 pa. Sanctuary management have so far refused to engage in direct discussions with the union, but Regional Officer Adam Lambert has said "While we do not believe that any cuts are necessary, we remain open to discussions about the proposed restructure. We cannot resolve the dispute unless we talk, and hope that Sanctuary management will now meet with us as a matter of the utmost urgency".